Alfresco living is a growing lifestyle trend around the world but is particularly popular in regions with warmer weather like Australia. And South Australians are the frontrunners in enjoying the outdoors and utilising their home spaces for an enhanced lifestyle. The popular choice is to add a verandah, patio or pergola as an extension of the indoors to the outside. 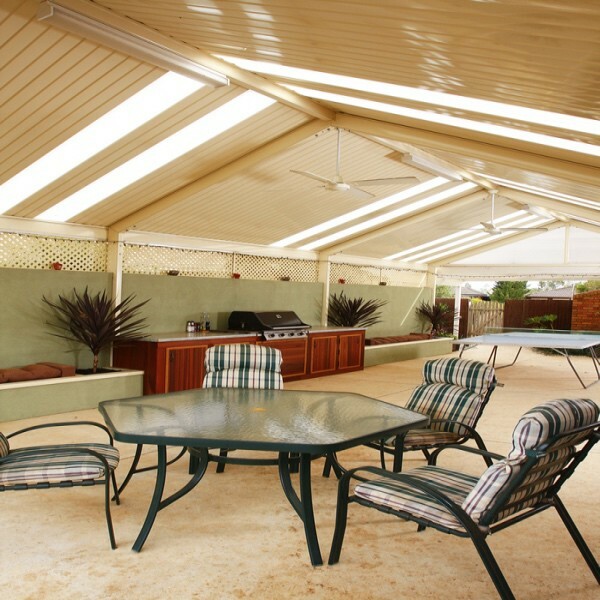 Rite Price Roofing is a specialist in designing and building verandahs, patios, pergolas and carports. Our aim is to make your life more comfortable so that you can enjoy your time at home with friends and family. Residents in Adelaide enjoy rather short and mild winters coupled with warm and even hot temperatures throughout much of the rest of the year. With the warm climate that the area is known for, many residents in Adelaide are looking for a great way to improve their comfort level while enjoying time relaxing outdoors. While there are several ideas that you can implement to maximise your comfort level while outdoors at home, a beautiful home improvement idea is to install a lovely verandah on your property. A verandah essentially will provide you with a large covered patio area across the front, rear or even entire perimeter of your home’s exterior. It can be enhanced with patio furniture, ceiling fans and other elements for improved comfort. 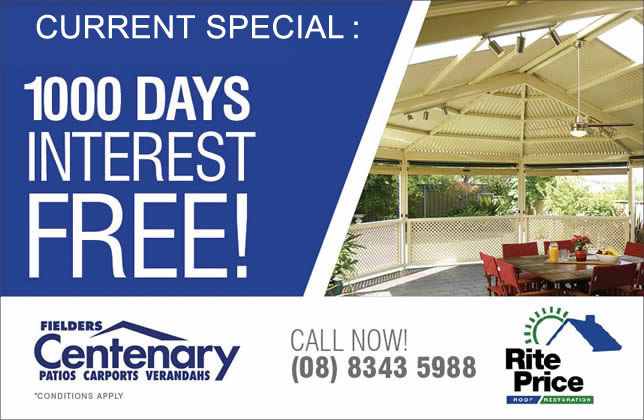 If you are thinking about installing a verandah on your property, you will want to reach out to Rite Price Roofing for the installation. While some outdoor feature that you may add to your property are not true additions to your property, a verandah will be permanently attached to your home’s exterior. More than that, most verandahs will have an extension of the roof line, and the same materials used on the main structure’s roof may need to be used for the roof of the verandah. This will impact the overall curb appeal of the property as well as it value and condition, and you do not want to trust just any company to work on your home’s roof. Rite Price Roofing provides you with quality design services so that the verandah will have a flawless appearance with the exterior of your home. It may look as though the verandah was part of the original construction rather than a secondary addition to the property. In addition, quality materials will be used for the construction to ensure the best overall results. 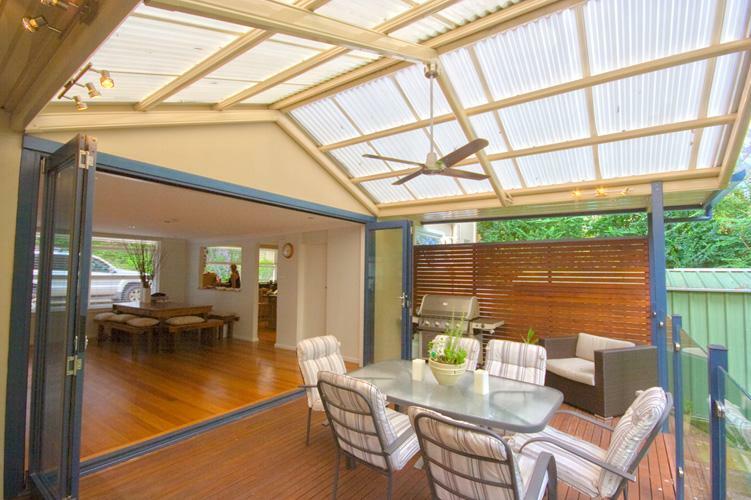 A beautiful verandah can be a true addition to your property that adds value in a number of ways. When the right design and materials are used with the construction of the verandah, the verandah can increase your property value. It can also provide you with a functional area that can be used to help you maximise your comfort level while outdoors on even the warmest days in Adelaide. In fact, your covered area may be ten or more degrees cooler in the shade than you may experience in full sunlight in your yard. 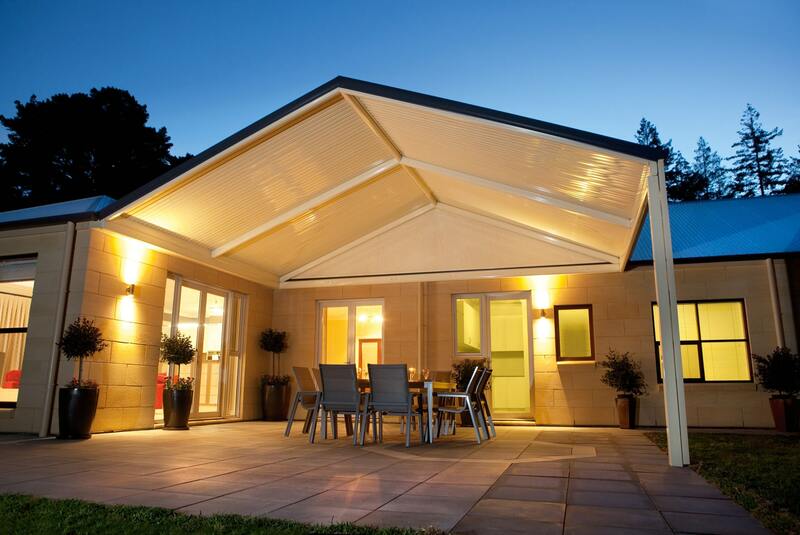 Installing a verandah on your Adelaide area home makes sense for a number of reasons. When you are ready to learn more about the design options for your home and to request a quote for the construction, contact Rite Price Roofing Adelaide for assistance. Patios in Adelaide are used for everything from relaxing and outdoor cooking to entertaining and more. If your home is like most throughout the community, it may already have a patio installed. However, you may not be pleased with the style, size or location of the patio. Perhaps you want to cover your patio for shade and comfort. When you want to install or upgrade a patio in your Adelaide area home, working with Rite Price Roofing is the perfect solution. A new patio will be a beneficial addition to your property that you can love for many years to come. If you’ve been looking for patios Adelaide homeowners seek out the professional advice and service of the Rite Price Roofing Adelaide team. A new patio can be a beautiful and valuable addition to your Adelaide area home, but the best patios are those that have been professionally designed. Through an initial consultation with Rite Price Roofing Adelaide, the consultants will learn more about your goals for your front or back yard, and they will create a design for your new patio that is ideal for your space. With professional design services, you can rest assured that you will love the end result. This is a space that you may spend many hours each week enjoying alone or with the company of friends and family members, and you will love the style and quality of a patio from Rite Price Roofing Adelaide. When you install a new patio space on your property through Rite Price Roofing Adelaide, you will enjoy flawless results with the installation. The ideal goal for many homeowners is to create a patio that looks as though it is a part of the home rather than an afterthought. Rite Price Roofing will use materials that closely match the materials used with your home’s exterior. This includes roofing materials for the covered section of the patio as well as other thoughtful materials for pillars, columns and more. With seamless results from the installation of the patio, you can rest assured that this will be a truly valuable addition to the property. You may already have a small patio area on your property, or you may not have a patio area at all. Regardless of the current layout of a patio, you can truly improve the function, style and value of your patio space when you turn to Rite Price Roofing for help with the project. You can reach out to the office staff at Rite Price Roofing to set up your first consultation and to begin discussing your patio design options. Simply call (08) 8343 5988 to request assistance from the skilled roofing and patio design team. A Pergola can be a truly treasured addition to your home’s exterior. Whether smaller or larger in size, it can provide you with a source of shade and can enhance the aesthetic look of your home with impressive results. It may be attached to the exterior of the home, or it may be a free-standing structure in your yard. If you have been thinking about constructing a Pergola on your property, Rite Price Roofing is the best provider to work with in South Australia. The craftsmanship of the providers you choose to work with will have a considerable impact on the finished result. A Pergola may be a structure that remains on your property for many years and even for the rest of the time that you own the home. You certainly want this structure to be built with integrity, to have a gorgeous design and to be built with quality materials. When you make the decision to work with Rite Price Roofing for your home’s Pergolas construction project, you can always expect excellent craftsmanship and quality materials. The team at Rite Price Roofing understands what it takes to impress you with a job well done, and we regularly work toward this goal with each project we complete. While there may be many factors to consider when selecting an installer to work with for your Pergolas project, the fact is that the experience and skills of the installer should not be overlooked. Rite Price Roofing has been completing veranda and Pergolas projects for more than 25 years in South Australia, and the company is known for its beautiful designs and great work. With newer companies, you may not entirely know what to expect when you request assistance with a Pergolas project. Rite Price Roofing has a proven track record with a solid reputation for excellence in the local area, and this makes it the ideal company to reach out to for any type of Pergolas project that you have in mind. When you contact Rite Price Roofing for assistance with your Pergolas project, you can expect to receive personalized assistance throughout the project. From selecting the best location on your property for the Pergolas to be constructed to covering all aspects of the construction, the team will handle all of the work for you. You can sit back and watch your beautiful Pergolas being constructed without having to lift a finger. Contact Rite Price Roofing at(08) 8343 5988 for a complimentary quote for the project that you have in mind, and we will travel to your home to meet with you personally. A single carport can provide you with a covering for your vehicles, a boat, an RV or other types of equipment. Carports may be installed on homes that have an existing garage space when the garage does not fulfil all of the needs of the homeowner. They can also be installed on homes that do not have an attached garage, and they are a more affordable solution than installing a full garage in most cases. Before you can install a new carport on your property, however, you must select the right style or design for your space. There are several different designs to consider. Here are four great single carport designs to choose from. If you want to have a carport attached to the home with a seamless design, extending the home’s roof is a great idea. Before you start renovating, though, you’ll want to consider the layout of the home on the land, the availability of space surrounding the home and the design of the home itself. Generally, you want to install the carport in an area where there is already an existing entry door or where a door can easily be installed. In addition, the carport should be installed in a place where there is adequate space for a vehicle to be parked. Another great option is to install a detached roof structure. This may be more suitable for homes with additional land available. The structure may be as simple as an open-air four-post structure with a roof. For improved aesthetic appeal, make sure you use trim colour and roof materials that match those of the main house. Some homeowners will create a covered walkway between the detached carport and the home for convenience which is great for staying protected from the elements. While some detached carports may have a basic design with four posts, others may be more elaborate. These may have a smaller or larger storage area or even a workshop attached to the carport. Some homeowners may decide to add a guest room or guesthouse to the carport. Those who work from home may use additional space with the detached carport as a home office. These buildings may have the same design elements as the main house, but some simple buildings may simply be made out of metal and fiberglass sheeting or other types of affordable materials. For expert design and construction advice on verandahs patios and carports in Adelaide call the roofing specialists Rite Price Roofing on(08) 8343 5988. we are the best you can talk to over verandahs patios and carports in Adelaide. Depending on the use of the carport and the space available, it may be ideal to create a drive-through style of carport. For example, if you plan to use the carport to store a boat or an RV, it may be more convenient and functional for you to install a carport with a pass-through feature. This way, you simply have to park the vehicle under the awning when you arrive home or to hook up the vehicle to the hitch before driving away. These may be very basic structures composed of steel, and fiberglass, or they may have the same design materials as the main house. If you’re considering a carport, you’ll want to select the right style for your needs and for your home. You can review some of the design options on your own to get some great ideas, but you should also contact a contractor for more insight regarding ideal design options. By understanding your needs, you can choose a carport design that looks great and adds value to your home.